He and Shell walked back toward the creek. Their voices swirled together in the wind that blew through the canyon. Aunt Cindy told me later that I threw the awfullest fit you ever saw when Shell left that second time. I fought so hard I even got loose of her for a second and took off after them. I only made it a few steps before she snatched me back up again. I wonder sometimes if maybe I sensed that something bad was on its way. Maybe that’s why I didn’t want to let her go. Maybe. The police took statements after she disappeared. When I was old enough I went back and read through all the reports I could find. Shell and Grandpa had filled up the entire gallon bucket with bones from that creek bed. They came back to camp at dusk, both convinced Shell had found a human skeleton. Everyone was disturbed but agreed that they would contact the authorities first thing next morning. Shell and Cindy went to sleep in the back of the camper and Grandma took me into the tent with her and Grandpa. Cindy’s police statement said she woke up in the middle of the night just after 3:00 a.m. Said she heard a train whistle and a pack of coyotes screaming all at once. She was frightened by that awful sound so she sat up and looked out the window of the camper. She saw a faint glowing red light off in the distance but couldn’t say for sure whether it was a tail light. She watched until it faded away, then went to lie back down again. That’s when she realized Shell was gone. She yelled for Grandma and Grandpa and they came tripping over each other out of the tent, wild-eyed and confused. Once they understood that Shell was missing, Grandpa grabbed a flashlight and went through the entire RV camp rattling families from their sleep and shouting for Shell. He tore through that camp up one side and down the other. But she was gone. The police arrived half an hour later but they weren’t too excited over a teenaged girl gone missing. They had a lot of questions about how our family got along and if Shell had any reason to run away. They even hinted she might’ve run off to escape her responsibility of raising me. That suggestion made Grandpa so mad he nearly went to jail himself. The only reason he didn’t was because Grandma started crying and begged him to get hold of himself. When daylight came, Grandpa saw that the bones had vanished too, bucket and all. He told the police about finding the skeleton on the creek. They looked at him like he’d lost his marbles and sent a man down to comb over the creek bed. He came back after fifteen minutes and said he didn’t find a thing. After a week of searching, Grandma said we had no other choice but to go back home. 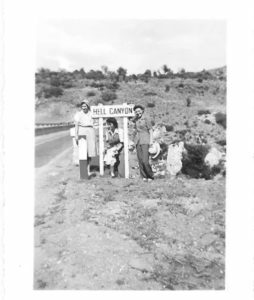 Grandpa drove us to Oklahoma, turned around and drove right back to Hell Canyon by himself. He was out there for a month before Grandma wrote him a letter saying he’d lose both his daughters if he didn’t come back in time to give Cindy away at the wedding. He came back like she asked, but he never stopped hounding the Fallow County police until the day he died. Eight years after Shell disappeared the stress of it finally took him. God as my witness, people really can die of a broken heart. That’s one thing I hope you never have to see. Strange how people in this little town still conspire on what really happened out there in the middle of the desert. My neighbors speak to each other in hushed tones that come to a sudden halt when they see me coming. They must wonder why I keep looking for her after all this time. But maybe none of them know what it’s like to lose their mama. Maybe it really isn’t fair to expect anyone to understand. That was the summer my mama disappeared. And I don’t guess I’ll ever stop hoping she finds her way back from Hell Canyon.